If you need to save space, the Roadside truck bed mattress is for you. Our high quality foam makes it super comfortable. Available in standard and custom sizes. The Roadside is our space saving and least costly semi-truck mattress. It’s great for truck sleeper cabs with low ceilings and stacked beds where there’s minimal headspace. It’s also very comfortable. It has a foam density of 1.8-1.9 lbs. per cu. Ft., which is specifically designed for the perfect balance between cost and comfort in a 5-inch thickness, where space is at a premium. 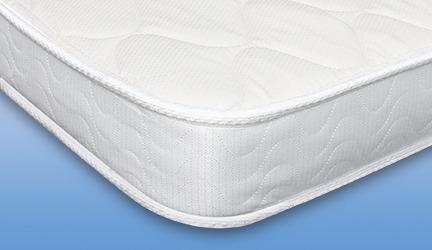 This high quality foam has a medium firmness and will not bottom out with a person weighing up to 200 lbs. In terms of comfort and durability, our Roadside truck bed mattress is superior to an inner spring mattress of the same thickness. This is definitely the mattress for you if you need to save space, and don’t want to sacrifice comfort. Like all of our mattresses for semi-trucks with sleeper cabs, the Roadside mattress has a sewn cover with a tape edge. The bottom of the mattress is skid resistant fabric so it won’t slide around, and the sleeping surface is made from quilted damask. The Roadside is available in standard and custom sizes. Best for Trucks Requiring a Thinner Mattress—Great for bunks and overhead cabs with limited headroom. 5-Inches Thick—When 5-inch thickness is required, quality and support should not be sacrificed. The Roadside maximizes quality and support given a limited thickness requirement. 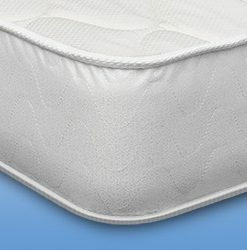 Great Support in a Thin Design—We use a height parameter of 5 inches with high performance density foam, which maximizes the amount of support for your body while minimizing the truck mattress height. Durable—We’ve designed this truck bed mattress to be at its best for a minimum of 5 years. Made in the U.S.A.—The Roadside is custom crafted in our NJ manufacturing facility in about a week, often less. Delivery is fast and shipping is free. Made to Accommodate Multiple Truck Brands—The Roadside mattress fits perfectly in (but not limited to) Ford, Freightliner, Kenworth, Mack, Peterbilt, Sterling, Volvo and Western Star trucks.